Numerical Weather Forecast group, has more than 150 published articles. U. S. Senate Minority Report: More Than 650 International Scientists Dissent Over Man-Made Global Warming Claims. Scientists Continue to Debunk “Consensus” in 2008. Over 650 dissenting scientists from around the globe challenged man-made global warming claims made by the United Nations Intergovernmental Panel on Climate Change (IPCC) and former Vice President Al Gore. 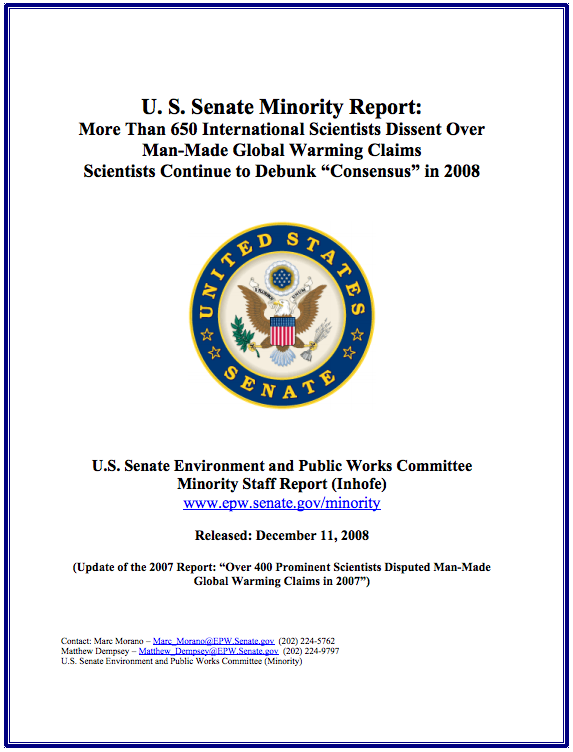 This new 231-page U.S. Senate Minority Report — updated from 2007’s groundbreaking report of over 400 scientists who voiced skepticism about the so-called global warming “consensus” — features the skeptical voices of over 650 prominent international scientists, including many current and former UN IPCC scientists, who have now turned against the UN IPCC. This updated report includes an additional 250 (and growing) scientists and climate researchers since the initial release in December 2007. The over 650 dissenting scientists are more than 12 times the number of UN scientists (52) who authored the media-hyped IPCC 2007 Summary for Policymakers. The chorus of skeptical scientific voices grow louder in 2008 as a steady stream of peer reviewed studies, analyses, real world data and inconvenient developments challenged the UN’s and former Vice President Al Gore’s claims that the “science is settled” and there is a “consensus.” On a range of issues, 2008 proved to be challenging for the promoters of manmade climate fears. Promoters of anthropogenic warming fears endured the following: Global temperatures failing to warm; Peer-reviewed studies predicting a continued lack of warming; a failed attempt to revive the discredited “Hockey Stick”; inconvenient developments and studies regarding rising CO2; the Sun; Clouds; Antarctica; the Arctic; Greenland’s ice; Mount Kilimanjaro; Causes of Hurricanes; Extreme Storms; Extinctions; Floods; Droughts; Ocean Acidification; PolarBears; Extreme weather deaths; Frogs; lack of atmospheric dust; the failure of oceans to warm and rise as predicted. – Solar physicist Dr. Pal Brekke, senior advisor to the Norwegian Space Centre in Oslo. and Materials Engineering of the University of Auckland, NZ. geographer and Antarctic ice core researcher. balance conditions.” – Prominent Hungarian Physicist and environmental researcher Dr.
once Hungary’s most outspoken supporter of the Kyoto Protocol. Department at the University of La Plata. Nebraska, and is the author of numerous papers for peer-reviewed publications. more than 50 peer-reviewed articles. Survey and for the U.S. Geological Survey.